I'm working on my sister's zero turn, with a Kohler engine. It's been sitting up for a year and a half. It'll run when I spray starting fluid into the intake, but won't run otherwise. Think it just needs the carb cleaned out? I've already drained the tank and lines, and put fresh gas in the tank. .
Prolly. There's some small orifices in there that get gummed up when gas sets in them. A rebuild kit with new gaskets shouldn't set you back much. Before that though, there's not a valve between the fuel tank and the carb is there? Haven't seen a valve. There's a filter, and a small pump assembly. All the lines had gas in them though. I'll change the filter this evening. Looks to me like ethanol may have struck again. Horrible stuff idn't it? I'd give the rubber fuel lines a good looking over too because that stuff does a number on equipment that sets in the barn more than it runs. Yep. But the sticker says E10 is ok, just no E85. Now, to remove the carb from a Sears ztl 8000. I got the air filter off. What's that wire attached under the bowl? Like an electrical wire? Or a wire rod? There's all sorts of rods and springs and junk for the throttle, choke, governor, etc. down there. Only thing electric I could think of is maybe the fuel pump. Do you have the manual? If not, is this it? The replacement decals at the very end of the manual say ZTL 8000 so I'm guessing this is for the model you're working on. OK, a little sleuthing shows that this thing has a fuel shut-off solenoid. I'd guess that the fail safe position for this deal is closed, so it may be stuck closed or not getting a power signal to tell it to open. That would certainly prevent fuel flow through the bowl and in to the engine. BTW: The fuel pump appears to be a vacuum driven model, not electric. Thanks I'll look at that tmrw also. I may just get on a change-parts-binge like I did as a teen. No manual, btw, but it's the model you listed. Edit:. Indeed, the manual you linked to is the one. I had to stop work on it this afternoon to go help give out Bibles at a local school (435, btw), and then go to a grandsons LL baseball game. I plan to get the carb off first thing in the mrng. Wish I knew how to check that solenoid. Wish I knew how to check that solenoid. Make sure the ring connector on black ground wire is firmly attached to whatever it's bolted to. Then, while it's still in place on the carb, disconnect the banana plug on that red wire and touch a 12V + power source (a jumper wire from the battery will work if the battery is charged) to the wire left dangling from the plug. I can't tell for sure, but in this picture it looks like the solenoid is in the up position. I think when it's the down position the plunger stem might actually extend out the bottom of the housing. If it does then you should see it pop out. If it doesn't then you can probably hear it click. If you can't hear it, maybe you can feel it with your fingers on the outside of the can. If nothing happens then unlpug the connector and unscrew it from the bowl. It looks like it has wrench flats so you can use a thin wrench to get it broken loose. Have a rag handy 'cause fuel will run out. Then you can do those same tests with it in your hand. You'll need to use that same wiring harness or rig your own so you can ground the pin that the black wire hooks to. If the thing doesn't move, you've found your problem. If it's mechanically stuck you can tap it with a hammer or try to shove the plunger down by hand and cycle it a few times until it loosens up. If the electrical coil inside doesn't work then you're SOL and it will need to be replaced. I had to stop work on it this afternoon to go help give out Bibles at a local school (435, btw), and then go to a grandsons LL baseball game. I plan to get the carb off first thing in the mrng. This retirement deal sounds like a lot of work. Do you ever just go to the beach and chill with a Corona or LandShark and watch the sun set? Yeah, every chance I get. I picked up a new tamper off the beach just last sun afternoon in fact. I need to post a pic. Anyway I skipped my scheduled golf game this morning and pulled the carb. The gadget on the bowl is an anti backfire device. Difficult to remove. I ground down an old 13mm end wrench thin enough to get to where I needed to unscrew it. Couldn't unscrew the jet, so I just stuck a wire through it, blew it out and sprayed carb cleaner on it and the bowl. New fuel and air filters, fresh gas, and it started right up. It revs up and down, so I'm checking if it has a governor now. Always something. I have had some minor electrical glitches over the past few years with my tractor (a 53 NAA converted to 12 volts). Now that I have moved back home, I am doing some minor repairs and maintenance on it before summer is in full swing. I decided to just replace the starter button and solenoid instead of troubleshooting the two again. But when I look to replace the solenoid from the tractor webpages, a 4 post solenoid is shown to be correct for a 12 volt NAA. The one coming off my tractor is a 3 post; however, it may very well not be correct. Right side large post is from hot side of battery and ignition switch. Left side large post is cable going to starter. Small wire on front small post is from starter button. My reading says 3 post solenoids are generally for electronic ignitions (but what does the internet know?). The tractor restoration parts place does sell both a 3 and a 4 post solenoid if I knew the connections to make. I haven't looked a Ford tractor in 35 year, but I'd say either one will work. If you get a 4 post solenoid, you'll just not use the 'I' post. You could always trace the wire from the ignition coil back to the ignition switch and see if it has a resistor in it. If it does then get the 4 post deal and run a heavyish wire to the terminal on the coil. But I'm pretty sure it doesn't. And, FTR, the smaller wire on the right side in your photo is not from the ignition switch. That's the wire that supplies power to the ignition switch. Does the solenoid know/care which direction the power feeds through it? Above is shown to be wired opposite the direction current passed through the solenoid on mine. It doesn't matter. They're simply two copper posts. There's another piece of copper inside that connects them together whenever the starter button is pushed. Or whenever you use your pliers to jump from the post that's hooked to the battery to the 'S' terminal. Don't tell us you've never done that. If you flip the starter and battery wires, you can jump it easier with just a screwdriver. Roadmaster will back me up I'm sure. Yes I have done the screwdriver trick. As for flipping the cables I’ve never seen that done before, not that it would not work. 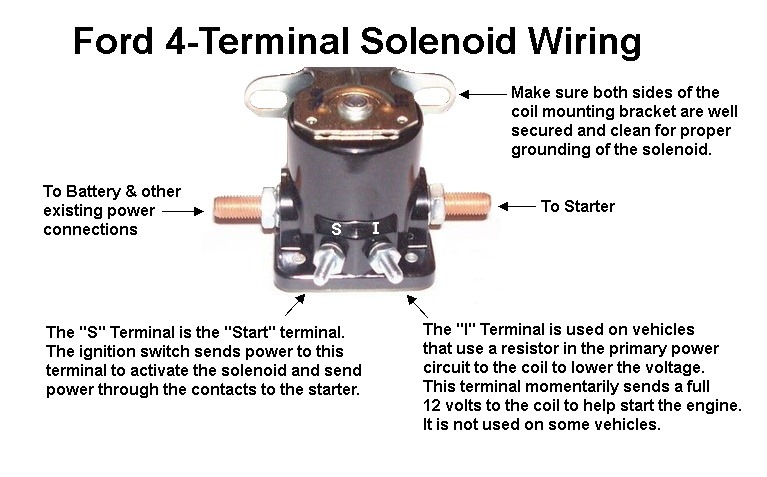 I do agree with the 4 post solenoid will work just fine as a 3 post replacement just don’t use the I terminal. 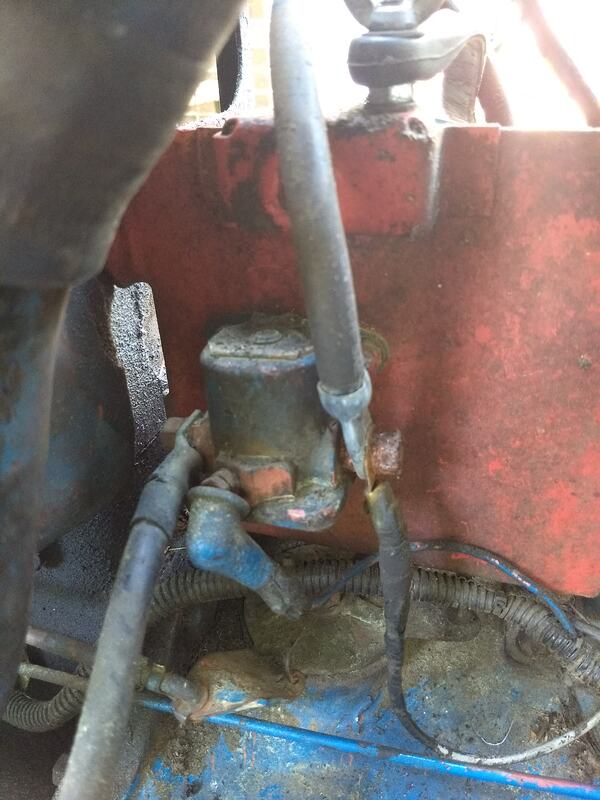 That brings up a question for the Judge, as this tractor was originally 6 volt and changed to 12 volt (a wise move IMHO) what kind of coil are you using? 6 volt, 12 volt internally resisted, or 12 volt externally resisted? Novice mechanic, coupled with a bit of tunnel vision, hampered my earlier communication--12 volt coil. Last year, my tractor mentor/mechanic, added a resistor to prolong the life of the points. So, conversation full circle, with what I learned today, a 4 post would seem appropriate now. 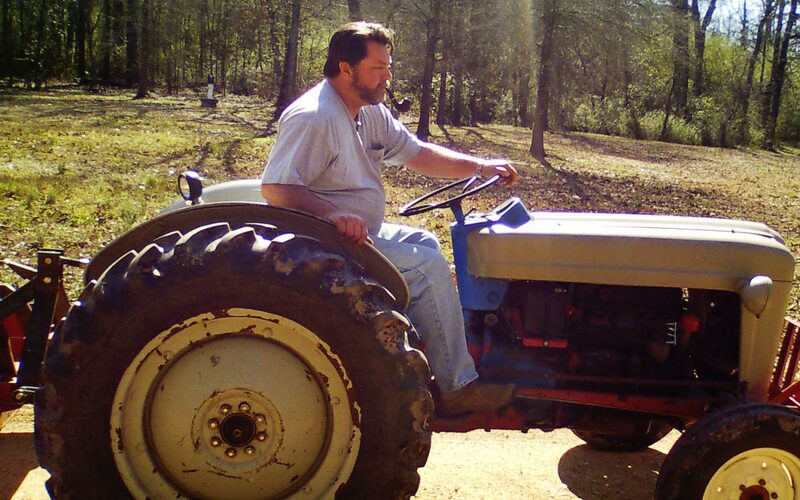 I bought the tractor about 2000. It is a 1953 Ford NAA "Jubilee." It is a "resto-utility" I suppose. I would like to restore it but continue to use it for everything around here. I bought it in running condition, but with lots of work needed of course. The thing that bothered me the most was that someone had painted everything except the wheels and rear fenders "Ford Blue." When I was out of work a few years ago, I took off all the front end removable pieces and cleaned down to bare metal. I painted with the proper colors. I have not taken time or effort to clean and re-paint the remainder. It will soon need a left rear tire. It needs brakes. We bush-hog our woods trails with it. We mow the acreage with a 6' finishing mower. I tend my driveway with a box blade. It also sees use snaking logs, pulling a trailer for firewood, using a set of pallet forks and whatever else. However, it is much more reliable when used often, so my time away finds it in needs of some sprucing up. Here is a pic from a few years ago (and about 30 lbs). I think the pipe is a Cristiano, not sure of the tobacco.